The easiest way is via the website, here is a step by step guide to help you through the process. 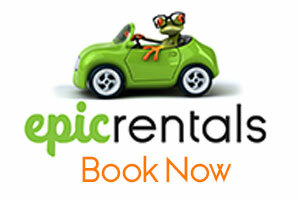 On the top left hand side of the home page is a box called “Book your Epic Car Rental” If you know the dates and location for your trip enter them in this box. Push the big green continue button. You will then be given a choice of vehicles available on your chosen dates. The vehicles will clearly be marked with how many people and bags each car can take along with a breakdown of daily rate and total rate for your chosen dates. Select the vehicle you want to hire and you will be directed to a page where you can choose any extras you require, GPS, Child Carseats etc. Then its time to decide what Insurance options you want, we recommend the “No Worries Mate” as it makes your trip stress free but the choice is yours. You then have the option of converting the chosen options into either a quote or a booking by choosing he appropriate green button at the bottom of the page. If you have chosen to make a booking congratulations you are on your way, just a few more steps left. This is where you enter a few of your personal details name, e-mail etc. To save time when you arrive we recommend that you enter the optional details as well stuff like your driver’s licence number, name as it appears on your licence. It’s all stuff we need when you arrive and before you take the vehicle so you may as well fill it out now. You will then be taken to a page where you enter your Credit Card details, don’t worry this page is secure and your details are safe. We only require a 20% deposit to confirm you’re booking so it makes it nice and easy for you. You will now be taken to a summary page were you can double check everything is all correct and you are happy with your dates and times, vehicle, any extras, and of course insurance. We are always here to help so if you are stuck or unsure of anything please just give us a call and we will be happy to help.